Mark your calendars for February 16, 2019 to join over 2,500 runners to celebrate Mardi Gras Baton Rouge style! Whether you are running the One Mile Fun Run, 10k or 15k the whole family can celebrate Carnival Season with the Mardi Gras Mambo. The 21st annual Mardi Gras Mambo will run in downtown Baton Rouge and starts and finishes at North Boulevard Town Square. 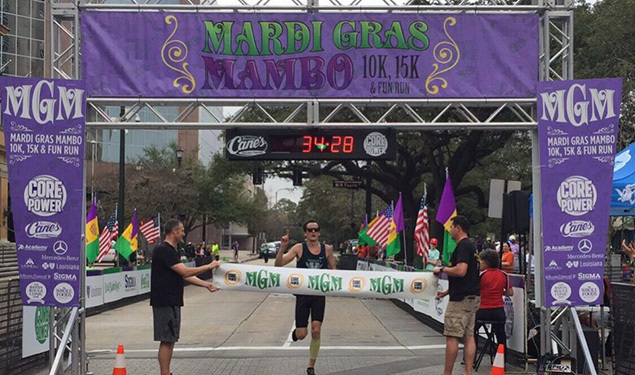 For the first 19 years, SportsBR produced the Mardi Gras Mambo 10k/15k road race. In 2018, FRESHJUNKIE Racing assumed ownership and production of the Mardi Gras Mambo 10k/15k. SportsBR continues to play a role in race production and remains as the charity benefactor of the event. 2018 marked the largest registered field in Mardi Gras Mambo history at just over 2,600 registered runners. Mardi Gras Mambo will offer multiple times & locations to pick up your packet. This way if you plan to drive in on race morning you will already be ready to race!Entry fees are NON-REFUNDABLE. Sorry, no exceptions. Once we receive and accept your entry, you will not receive a refund if you cannot participate. Acts of God or man that prevent the event from taking place will not result in a refund. You may not give or sell your number to anyone else. Should you be unable to participate due to injury or illness you can defer your entry to next year’s event for a deferral fee of $10. Email info@runmambo.com for info. You must present a valid government-issued picture ID to pick up your packet. If the races are not filled to capacity, there will be a registration booth at packet pickup and on race day.Every participant will receive an Official Participant Guide and a registration confirmation via email. Please CLICK HERE to get another confirmation email. Bring a print out of your confirmation email and your photo ID to pick up your packet. A digital copy (your phone screen) is allowed.If you cannot pick up your packet before race day, there will be a Proxy Packet Pick-up (picking up a packet for someone else) available. The process for Proxy Packet Pick-up is as follows. The proxy must present a photocopy or a digital copy (your phone screen) of the participant’s ID along with a copy of the participant’s confirmation. There are no exceptions to this rule. You must be 18 years or older to proxy pick up for another runner. There is no Proxy Packet Pick-up on race day.